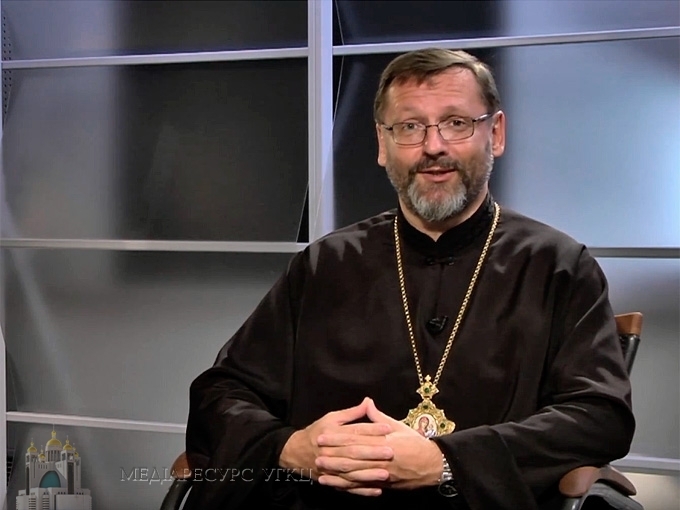 The Head and Father of the UGCC His Beatitude Sviatoslav in a regular broadcast of the interactive program "OPEN CHURCH" on the subject "Parents and children" told how to be good parents, how to deal with "problem" children, whether it's necessary to punish children, and also, gave a couple of tips regarding a proper gender education. • A child is presented by the Lord our God to his/her father and mother as a fruit of their love. In order to grow and develop spiritually, psychologically and physically, a child needs love. Parents, love your children! • A child needs both father and mother. Church in its social doctrine says that a child has the right to family life, and needs both father and mother in order to grow and develop fully and integrally. In such a family there are all necessary conditions for his/her proper upbringing. • There are wounded families, when someone is missing, then a community tries to help in raising a child. However, no one can fully replace the father for a child. • Parents – are first essentially important teachers for a child. Their primary duty is to raise children to love and to be responsible. • Children need to see in their parents' behavior an example to follow. That model, which they receive during their upbringing, they will follow all their lives. • One can become a great and wise man only by being brought up in the family of wise parents. • It's important to know how to raise children as free people, according to the understanding of the existing notions of freedom. In particular, in the Christian sense, true freedom means a person's ability to choose good things. • The children need to be correctly motivated. Then we will be able to find the key to their hearts in order to teach them to be conscious, wise and responsible. • What is important for parents becomes important for children. If a child sees that his/her father and mother pray daily in the morning and evening, he/she will follow their behavior. • Father and mother must lead their child into the invisible, spiritual world. Since the sense of our earthly life lies in the proper preparing for eternity. • The way you treat your parents, your children will treat you. • If children see that their mother says one thing and does another, the validity of everything you teach them, will be shaken in their eyes. • To teach children to love by means of physical punishment is impossible. Because you cannot force anyone to love. • It's not good, from the Christian viewpoint, to punish a child physically because it hurts spiritually and mentally. In such a case it's difficult to say that he/she will become responsible, rather he/she will know how to skillfully avoid punishment. • It's impossible to raise a free and responsible child by means of punishment and prohibition. You have to talk to children, devote time to them. • If a child refrains from bad things because he/she is afraid of parent's punishment and behaves according to the model offered by them, then he/she will try to release from it on the first occasion. But will parents succeed with such pedagogy? • Occasionally children are problems for parents because they restrict their private desires. Such a child becomes difficult. • Difficult children are wounded... They received trauma as a result of wrong attitude towards them. Regardless of a child's temperament, he/she is a developing person with dignity. If you come up correctly to your child's upbringing, without seeing him/her as an obstacle or problem for yourself, he/she won't grow as difficult. • Parents should learn to understand correctly their children's behavior, and to correctly reveal the reason for certain kinds of reaction which they see. • Father and mother should know their children. This means to see much deeper than what appears before your eyes. • Problem children are often those who are deprived of fatherly or motherly love and attention. They protest with their behavior against wrong methods of upbringing. They don't feel that their father and mother love them. • By misbehavior children try to draw attention to them. Each case of misbehaving is a question which parents and teachers must ask themselves. • There is no single child who would be a problem in himself/herself. But there is child's behavior, which you must understand, interpret correctly, and choose the right model of upbringing in order to help him/her grow a free and responsible personality. • To inform about certain values in this realm should only the closest people - father and mother. • No one has the right to intrude into a child's inner world with dirty hands. • Childhood - is a special sacred period of a person's life. Motherhood and childhood must be protected. • When we steal childhood from children: either by forceful labor or forceful participation in military actions, or perversity (early sexualizing, imposing on them something unnatural and strange in this period of life), then the right to be a child is destroyed. • None of the programs of gender education can remove parents. • In the UGCC we used to develop the program "Body as the Temple of Holy Spirit", in which we try to help parents become good teachers for children in the sphere of gender.